so I have suddenly become a fan. I still think she is a total Madge derivative, and she is pretty vacuous in interviews, but I like her anyway. Also, anyone who loves clothes as much as I do has to love La Gaga– she is fearless, zany, and looks great in pretty well anything. 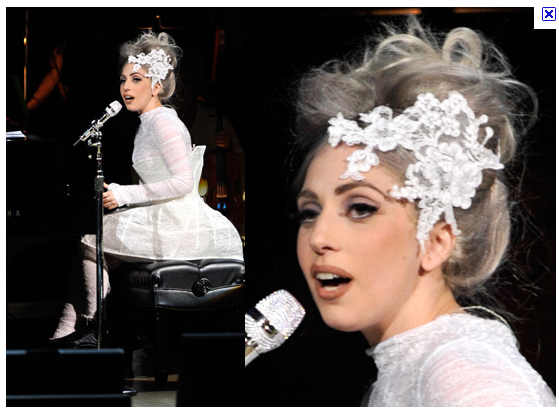 And this is Gaga we are talking about, so you know I really mean ANYTHING! So, when I saw her on the cover of Vanity Fair recently, I snagged myself a copy. 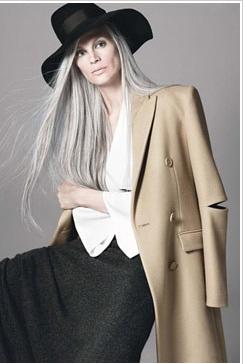 My other motivation for picking up the magazine stems from my another recent preoccupation of mine: the grey hair trend. Granny "chic" (someone does not know what the word means, it seems!) teen blogger, Tavi Gevinson. Oh, dear-- more lipstick, please. And some shut-eye. it is the cut, not the colour that does so– it is not a flattering length or shape on her. 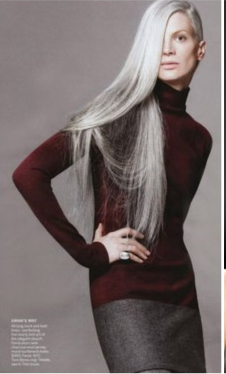 so looking old and grey is a real possibility for me, whereas it is not for Gaga, Kelly and Co.
And here is the thing: my actual hair colour IS grey! 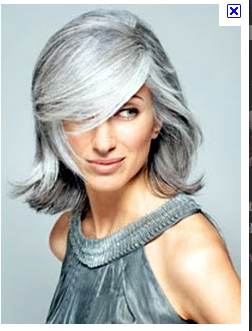 So I am thinking that this silver trend might be the way to go to get from dyed to natural without having to chop my hair off to an inch long and then just let the grey grow in while sporting sad little blonde/brown tips. You know the look– you see it on older ladies with badly fried hair: their roots as white as cotton with the ends all henna-ed and crispy in varying shades of orange and black. Horrors! And I know the time is coming soon when I am going to have to face my senior citizen-worthy hair colour; there is no colour I can dye it that does not see me with horrific roots a week and half into the dye job. Growing my hair longer is bad enough– I dread the phase of growing it out to its natural steely shade…. I am saying that the cool kids might just provide me some useful cover, you should pardon the irony. I will appear to be edgy, cool, sophisticated, fearless. As opposed to just plain old and grey. Any chance (barring plastic surgery) I might end up looking like this? LHR is on-board but, Gentle Reader, what would you do if it were YOUR hair? See, it is one thing to say, “Go for it!” when it is not your hair– what if it were? Or, seeing as I am the adventurous sort when it comes to hair colour anyway, do you think I should give it a whirl? As my wise mother so often said when I was a teenager, “It’s only hair,” so I guess I could change it back if it is too god-awful. No Poker Faces– just the truth! I voted ‘yes’ because you’ll never know unless you try it. You’ll have to be extra vigilant with your make-up and wardrobe choices to ensure that you don’t look all washed-out. I don’t know that I could pull it off; I’m just too lazy! Yes, I agree about the make-up and wardrobe, but I have been there before: severely red-not-to-say-burgundy hair required similar attention. And I looked SO severe in my glasses with my hair that colour. With silver, I think I will look rather granny-esque in my glasses… Still, it is not really a question of “if,” it is more a question of “when”– eventually, I will have no choice and I wonder if that “eventually” is now…. It is NOT age appropriate to go grey just cuz we are in our 40’s!! Come on! 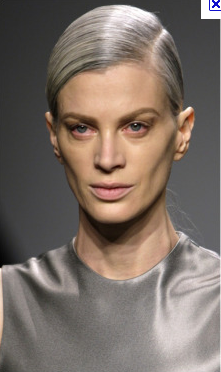 I think that will be a gorgeous look for you in your 50’s. But I love how your hair looks now… save the grey for a decade or you’ll be bored silly with it for the rest of your life! Here’s my suggestion. Add some drama. That is, don’t’ just leave it gray, streak it or something. I would make it something kind of cool at this point. Then you can dye it another colour later in the year. Don’t think of it as your natural colour, think of it as a manufactured colour. Just for the record, I’ve been saying Lady Gaa Gaa is just Madonna wrapped with a bit of Cher ever since I noticed her (which is probably eons after everyone else). I don’t find anything she does/wear that outrageous. However, I do love it. Just not as crazy as everyone says she is. As for Gaga, I hadn’t thought of Cher (I thought Elton John, but tomayto-tomahto, really! )– good analogy. You must look up some of her truly hilarious outfits (like latex one with only her mouth showing– sooo goofy!). Frankly, I agree– I’d LOVE to wear those outfits: they are theatrical and silly and just plain fun. Isn’t that what clothes are supposed to be?